Bijapur or Vijayapur is another important district located in northern part of Karnataka, India. The local language is Kannada. Bijapur is surrounded by Sholapur on the North, Sangli on the North West, Belgaum district on the West, Bagalkot towards the South and Gulbarga on the East and Raichur on the South east. Bijapur is known for historical monuments like Gol Gumbaz, Bijapur fort and many more. It is also one of the top ten most populated cities in Karnataka. 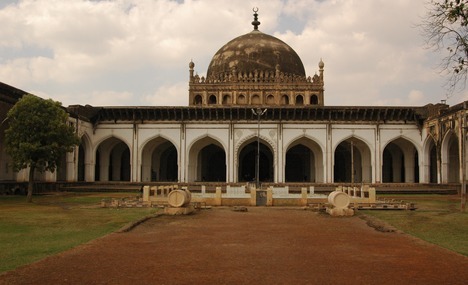 Bijapur was ruled by Adil Shahi dynasty from 1490-1686. The rule of this dynasty came to end when Mughal emperor conquered Bijapur in the year 1686. Historically Bijapur was ruled by many dynasties. The inhabitated place of stone age shows as to how old the district is and its history. some of the important dynasties that ruled Bijapur are Early Western Chalukya from 535 AD-757 AD, Rastrakutas from 757 AD-973 AD, Kalachuri and Hoysala from 973 AD-1200AD, Devagiri Yadava from 1185-1312AD. Bijapur then came under Delhi Sultanate and later from 1347 under Bahamani Kings later under Adil Shahi Dynasty. The major rivers that flow in Bijapur districts are Krishna, Bhima, Doni and Sina River. Krishna river is the most important river. It has a course of 125 miles and the most important dam that is built on it is the Alamatti Dam. Northern part of Bijapur District is drained by Bhima river which stretches for 20 miles. The climate of Bijapur district is dry and very healthy. During summers the maximum temperature touches 42-430c and during winter season the minimum temperature hovers around15-200c. April and May are extremely hot summer months and November-January are winter months. The district has many touristic places in and around Bijapur. Some of the important touristical places are Bijapur fort, Anand Mahal, Gol Gumbaz, Gagan Mahal, Anand Mahal, Saat Manzil, Jal Manzil, the tombs of Ali Adil Shah 1 and II, Almatti Dam and many more. Near by touristic place are Badami, Aihole and Pattadkal. The world famous Bijapur fort is located in Bijapur district of Karnataka, India. Also known as Vijapura Kote (Kote means Fort in Kannada Language) is an example for grandeur, symbol of pride and strength. The fort was built during Adil Shahi Dynasty. The fort and the town are known as Agra of South India. Bijapur has a very interesting and rich history. The history dates back to 10 and 11th century when Bijapur was ruled by Kalyani Chalukyas. The fort was established by Kalyani Chalukyas which was then known as Vijayapura which means city of Victory. Vijaya is a Kannada word which means victory and pura means city. Later the city was conquered by Khalji Sultanate. By 1347 the city was conquered by Bahmani Sultanate. The city was again renamed as Bijapur or Vijapur during Bahmani period. 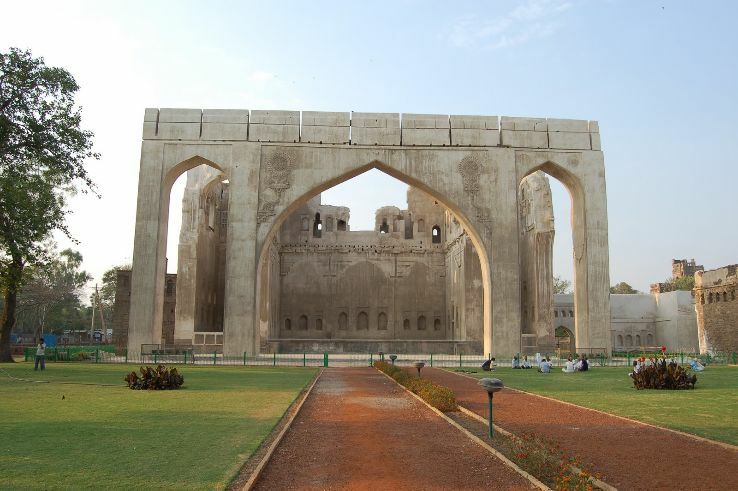 Yusuf Adil Shah who was the Sultan of Turkey and son of Murad II joined the Bidar court in the year 1481. At that time Sultan Mohammed III was the Ruler of Bidar. Because of the bravery and loyalty of Yusuf, he was appointed as Governor of Bijapur. Yusuf built Arkilla fort a Citadel and Faroukh Mahal. The artisans and the architects were from Rome, Turkey and Persia. Yusuf who declared himself as an independent ruler established Adil Shahi dynasty in 1489. Ibrahim Adil Shah who was the son of Yusuf Adil Shah succeeded his father in the year 1510. Ibrahim’s mother was a Hindu and daughter of Maratha warrior. Ibrahim constructed Jami Masjid within the fort. Ibrahim was succeeded by Ali Adil Shah who built Gagan Mahal, Ali Rauza, Chand Bawdi and Jami Masjid with the fort. Sine Ali Adil Shah had no heir of his own; he made his nephew Ibrahim II as his successor. At that time Ibrahim II was a minor hence his mother Chand Bibi took care of the kingdom until Ibrahim II became major. Ibrahim II was tolerant towards both Hindus and Muslims and was a able administrator. He ruled for 46 years. He was given the title as Jagadguru Badshah. He built many temples with the fort and composed various verses to Goddess Saraswati and lord Ganapathi. He built Gol Gumbaz which is world famous and second biggest dome in the world, Mallik- E- Maidan and many more. He was succeeded by Ali Adil Shah II and later by Mughals and British. Bijapur fort is a huge fort which has many structures inside the fort. The fort consists of mosque, tombs, gardens built by Adil Shahis in Persian and Turkish architecture. During the Adil Shahi dynasty for 200 years they built 50 mosques, 20 tombs and 20 palaces hence Bijapur is rightly called as Agra of South India. The fort and citadel which was built by Yusuf Adil Shahi is in the form of two concentric circles. The citadel which is at the centre of the two concentric circle has circumferential length of 400m. 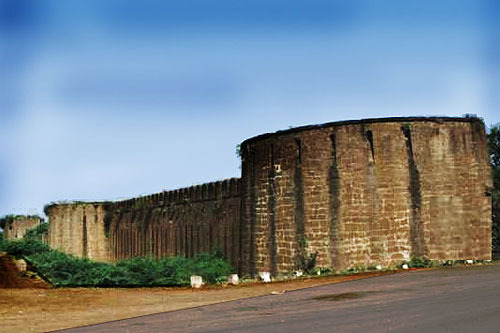 The length of the fort’s outer wall is 10km and is strongly fortified with 96 bastions which are of different designs. The fort has five gateways namely Makka gate-West, Shahpur gate- North West, Bahmani gate-north, Allapur gate-east and Fateh gate- South east corner. Ibrahim tomb: It contains the tomb of Ibrahim Adil Shah II and his wife Taj Sultana. It was built in the year 1627 with the help of the Persian architect Malik Sandal. Even his tomb lies in the courtyard. It is a fine structure of two buildings having beautiful delicate carvings on it. The tomb has both a mosque and a garden within it. It is understood that the structure has been built on a single rock slab which has a basement. The basement was used to store ammunitions and food. The gateway for the mosque is made up of teak wood and beautifully decorated with metal strips. Henry Coursen who is an architect called it as Taj Mahal of the South. Ali Adil Shahi I built the Gagan Mahal in the year 1561. The palace has a durbar hall and it consists of three arches out the central arch is the widest. Ground floor has the Durbar hall and first floor was the private residence of the royal family. But now both the floors are in ruins. Adil Shahis built Asar Mahal in the year 1646. This is located towards the east of the citadel. The palace is connected to the fort with a bridge. This Mahal is also known as Dad Mahal as in the beginning it was used as hall of justice. The Mahal faces an artificial lake and has beautiful paintings on the walls and ceilings. Women are prohibited from entering this Mahal. Some of the other important places with the fort are Mehtar Mahal the entrance of this has been built in Indo Sarcenic style, Barakaman which means 12 arches is a mouseleum of Ali Roza which was built in 1672, Malik-E- Maidan and Taj Bawadi. Bijapur does not have an airport and the nearest airport is Belgaum which is around 200kms. Bijapur is well connected through road from different parts of India. One can reach Bangalore and then travel by bus. It also has good train facilities. Distance between Bijapur and Bangalore is around 530 km. from Hubli it is 200kms, from Belgaum it is 217kms, from Gulbarga it is 145 Kms, from Bidar it is 270 Kms.